This week’s ROTW is “get well” shout out to one of the towering figures of the late 20th century, Nelson Mandela. First released in March 1984 by The Special AKA, the Jerry Dammers-penned and Elvis Costello-produced track became an instant anthem for the anti-apartheid movement around the world. It out-sold anything ever written by Margaret Thatcher. Released on the peerless Two Tone label (TT26) it was the last in series of era-defining singles that I owned before my brother took them to a disco …… and forgot to bring them home again. 26 original Dance Craze bangers missing in action (I have to say my brother nearly went missing in action when I found out). 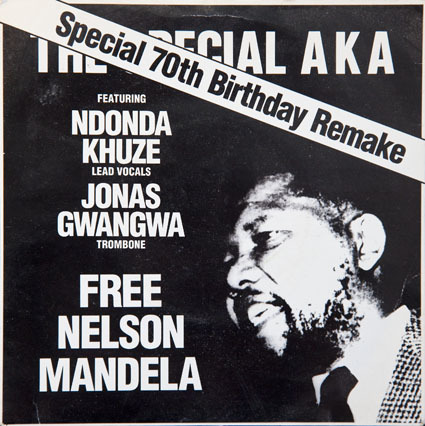 When this version was released for his 70th birthday in 1988, Mandela was still in prison on Robben Island. It features Ndonda Khuze on lead vocals and Jonas Gwangwa on trombone. The original is on the b-side. It wasn’t until 1990 that he was released, after 27 years in “captivity”. As Mandela said “It always seems impossible until its done.” Get well soon Mr Mandela. How about a little dance then? This entry was posted in Music and tagged 2 Tone, 7" single, Elvis Costello, Free Nelson Mandela, Jerry Dammers, Nelson Mandela, picture cover, re-mix, Record, Ska, The Special AKA, The Specials, Two Tone, vinyl. Bookmark the permalink.